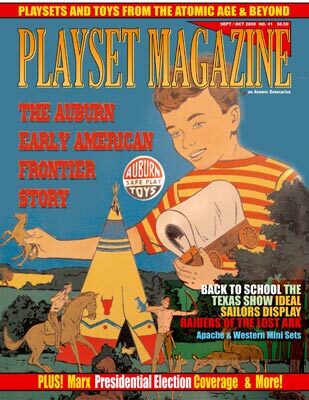 ALL- AMERICANA ISSUE featuring Marx Election Coverage and Auburn Early American Frontier playset! this beautifully designed issue will take you back, back, back into the deep forests and glades of frontier America. You'll need your tri-corn hat and flintlock with extra powder horn to go THIS deep into the wilderness settlement areas to see the beautiful Auburn set. Here are beautiful full bodied 3" tall figures featured for the very first time in color. There are Indians, Frontiersmen and Women, wagons, horses and more - like a beautifully designed cabin and many wilderness animals. You'll be sure to enjoy this engaging trek back! If it's current events you favor, you'll enjoy the Marx Presidents coverage. From a current perspective, it may be hard to understand why Marx put so much artisanship and money into the beautiful White House and Capitol buildings he made, not to mention the exhaustive series of Fives sets of accurate and beautiful Presidential figures. But then, we come from a very different time. Place yourself back in middle school Civics Class -- you learn about all the Presidents, the intricacies of government, and the full meal deal history on Washington D.C., our seat of federal government. Remember how you marveled that Washington was a sort of "state" all its own? We absolutely got seeped in the history on this one, and collector Mark Hegeman makes an excellent guide through the intricacies of this unique and beautifully rendered -- and inexpensive!-- Marx line. You'll also enjoy a lot of "selected short subjects" - there's reporting on current news, toy reviews, toy shows and movies, plus the rarer MPC "Raiders of the Lost Ark" playset! Say what? Yep - and its all here in this gleaming issue dedicated to life here in these great states! We'll see you right here -- and huddle together while we wait out the real-life excitement of the elections!